Wendy West has been active all her life, but as she got older she noticed that her energy level and metabolism were slowing down and the scale seemed stuck. At 43, she gave birth to her daughter Alyssa and also watched her mother’s health rapidly decline. She became determined to be around not only for her daughter’s entire life but also not experience the same health challenges her mom did. After joining Mo-Mentum, group fitness classes became a regular part of her routine. She dropped 10 lbs, noticed positive changes in her energy level, confidence and attitude and found a new group of fit friends at the gym. 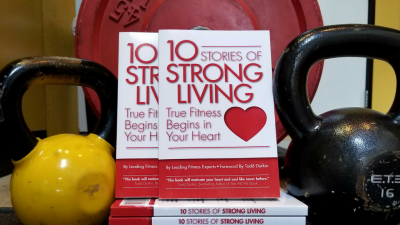 Through her fitness journey, Wendy developed a passion for helping older adults and people who were new or returning to fitness get healthy. 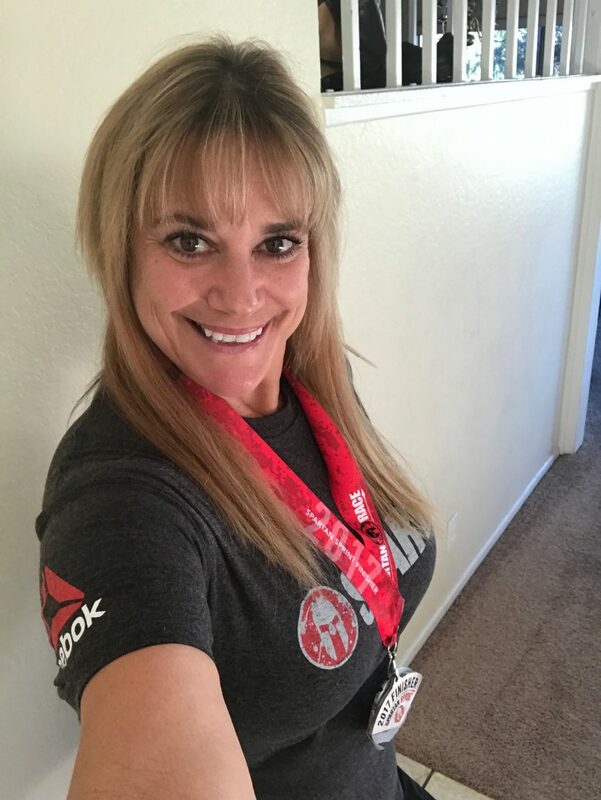 Now Wendy is unstoppable, she became a certified fitness instructor, has began teaching classes at Mo-Mentum Fitness and recently completed her first Spartan Race. At 57, this Superhero is unstoppable. Congratulations, Wendy! Describe what your life (and your health) was like before fitness. I have always tried to do some form of fitness. As I got older I noticed I needed to change things up. My energy level was not good and my metabolism was slowing down. I rollerbladed, walked and did fitness videos at home. Although they helped it just did not seem like I was making a big difference in how my body looked. The scale was stuck. So I decided it was time to go back to a gym. Actually, a couple of experiences made me think about how I was taking care of myself. When I had my daughter at 43, I noticed it was a lot harder to take off the weight that I had gained and to change the shape of my body. The second experience was watching my moms health deteriorate. She had so many healthy issues (high blood pressure, congestive heart failure, pacemaker and ended up being an insulin diabetic). She passed away when my daughter was 5 years old, just before her 75 birthday. The last five years of her life were spent in pain and suffering. I realized I wanted to be there not only my daughter, but hopefully for grandchildren in the future. I realized my fitness regime was not working for me. So I contacted Amanda and explained to her what was going with my fitness, and how I wanted to change my life and become a fitness instructor. My passion has always been to help others and make a difference in their life. Especially older individuals and beginners who wanted to have a healthier lifestyle. I wanted to make it easier for them to be active and increase their mobility. Amanda was more than inviting and willing to help me. So I went back to working out at Mo-Mentum Fitness. I have noticed that I definitely have more energy. My body muscle has leaned out and I have so much more endurance. I feel younger and apparently I have changed how I look. My friends and family have told me how healthy and strong I look since beginning my new fitness program. I am a much happier person since getting back to the gym and starting on a regular fitness schedule. I have lost 10 lbs. and my confidence and pride in myself have increased 100 percent. Achieving my goal to become a certified group instructor has been the biggest change. I would have never have believed I could have completed the course on my own. With the the help of Amanda, the trainers, great members at Mo-Mentum Fitness and all of their encouragement I passed the course and received my certificate. I am deeply grateful for all of them. Very proud to have accomplished the one goal I have been talking about doing for years. What kind of changes have you seen there? What do these changes mean for your lifestyle, longevity, finances, etc? I am generally much happier and less stressed. Without my workouts I am grumpy and have no energy or patience. I see a total difference in my attitude. My new group of friends are not only supportive of me, but encourage me to be the best I can be. I know by having made these changes, I will live a much healthier and longer life. I have the confidence now to work towards my goal of making a living by doing what makes me happy – Fitness. Working to help others improve their health with fitness and increase their mobility in their every day life. Another accomplishment that gives me great pride is training for and completing my first Spartan Sprint. This was the first medal I have every earned in fitness as a competitor. Working out at Mo-Mentum and training with such awesome individuals gave me the confidence to believe I could do it. With the help of everyone in our group at Mo-Mentum who entered, I finished the race and received my medal. It was an amazing feeling. I felt so proud of myself. Never in a million years did ever picture myself running a Spartan Sprint at 57 years old. I like to feel good about myself and of course try to keep up my appearance. I may not be able to be that 30 year old again, but I sure can feel younger and more confident. I believe you are what you want to be. You can do whatever you want. None of this will come without putting in the work and having enough faith in yourself to do it. So when I make fitness a priority I am making myself a priority. I also want to be there for my daughter as she grows up. Being an older parent, I always worreed that I might not be there for some of her life achievements (marriage, grandchildren, etc.) By making fitness a priority, I know I am doing everything in my power to make sure I can be there for her. Taking care of myself. Knowing that I am doing all the things I can possibly do to be the best person I can be. Taking care of my family. Being a great mom and good partner. Most of all, I feel truly at peace knowing I am leading by example. It makes me so happy knowing that I am giving my daughter the tools to know how to live a healthy lifestyle. Teaching her to be proud and to believe in herself. I feel like a changed person. I am getting stronger every day. Not only physically but mentally. I believe in myself again. No more blaming others. I now take responsibility for my own actions and my health. Knowing that positive changes come with making changes in your own life. I have made amazing new friends. My workout buddies have similar goals. I now have people in my life who encourage me and generally care about what I am trying to achieve. Mo-Mentum has become my go to makes me happy place. Always a smile when I walk in, acknowledgment for a job well done, and tons of encouragement. Fitness is going to be a part of my life forever. I am looking forward to encouraging others to do the same. Specifics: age? job title? children? spouse? Age 57; I work at home as a mom and helping out with our home business. I am gaining my experience in teaching group fitness and looking forward to doing this as my main job in the future. I have one daughter, Elyssa, age 14 and have been in a relationship with my daughters father Scott, for 22 years.